Get ready to have your faith in humanity restored, because this story about a whole community uniting behind one of its own is the happiest news you’ll read all day: This town just rallied around a guy with a big snake to check out the big snake! Wow. You’ve got to admire this selfless display of togetherness and compassion. Occidental, CA might appear to be your average small town, but when its residents heard that neighbor Michael Rudder had a big snake and nobody was looking at it, they leaped into action to go look at his snake. One by one, neighbors, co-workers, and students all came running to give attention to the guy’s big snake, and even though no one asked to hold it, several people did get to touch it, and that’s incredible. It just goes to show how many people in one community can gawk at a neighbor’s big snake when they join together! Uh, we’re not crying. You’re crying. This is a truly inspiring story for coming together to look at a snake. 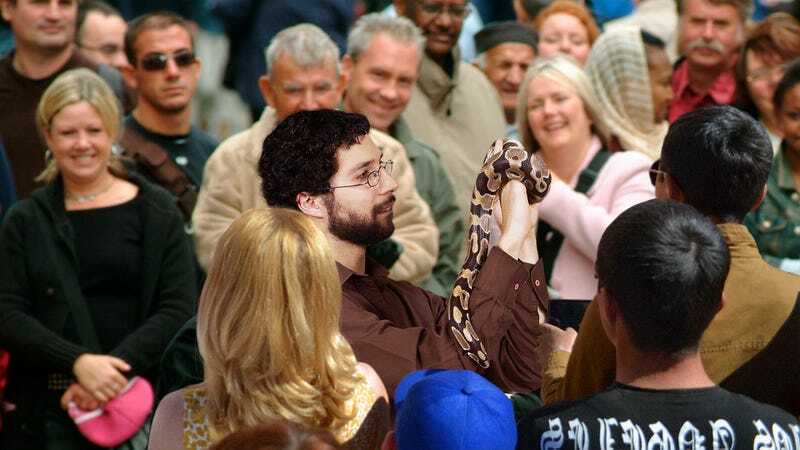 Although some people left after an hour of looking at the snake, others stayed and looked at Michael’s snake until 3 a.m., and that is beautiful. If every town in America was like this, the world would be a better place. Community for the win!